Just recently, some people asked me how to convert Blu-ray movies to MKV video for glorious HD enjoyment on mobile devices, or computer without using Blu-ray drive. Some asked me how to convert Blu-ray movies to MKV with subtitle, how to rip Blu-ray to MKV with subtitle and audio track, or with all original subtitles and audio tracks retained. So today I am here to give you 3 solutions to rip Blu-ray with subtitles, more specifically, to rip Blu-ray to MKV with subtitles. Users are up to themselves to choose their preferred one to rip Blu-ray movie with subtitle, or to rip Blu-ray movie with multiple subtitles. If you are expecting to rip Blu-ray to MKV with selectable subtitles, audio tracks and lossless quality, Leawo Blu-ray to MKV Converter is your choice. The program does not only fulfill all these demands, but also provides chapter selecting function. Check it out while I show you how to operate on this superb video converter. Step 1: Download, install and launch Leawo Blu-ray to MKV converter. Leawo Blu-ray to MKV Converter has both Win and Mac version (click Leawo Blu-ray to MKV Converter for Mac to find the detailed information of the Mac version). Please make sure that you get the right version based on your computer’s operating system. Here I will take the Windows version as an example to show how to convert Blu-ray movies to MKV with subtitle and audio tracks. Enter the main interface of Leawo Blu-ray to MKV Converter, where you can load Blu-ray movie by clicking “Add Blu-ray/DVD -> Add from CD-ROM” and choosing the currently activating Blu-ray driver. Three converting modes are selectable. “Full Movie” converts the entire movie, “Main Movie” converts the longest chapter by default while “Custom Mode” allows you to choose your desired chapter to convert specifically. 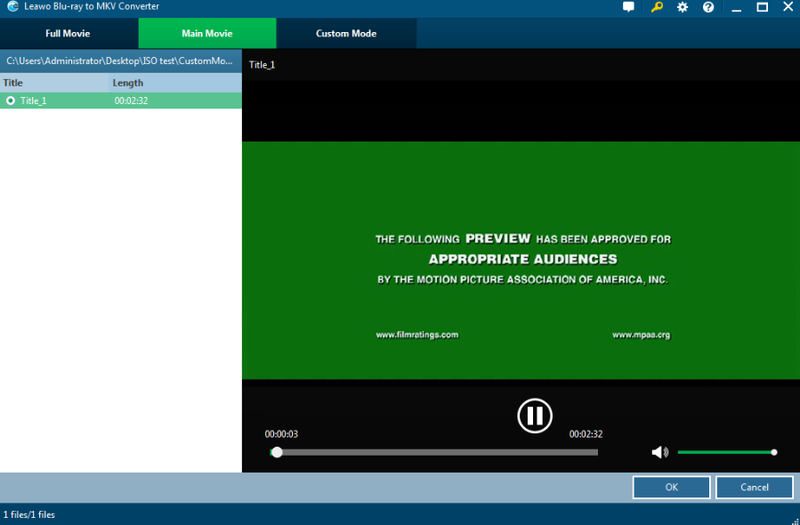 Video preview is available on the right. Click “OK” to proceed. Two drop down boxes, entitled “Subtitles” and “Audio”, are easy to find when you are brought to the video list window after the last step. Click each to choose your desired subtitle and audio track. When you are sure you have done all the settings to the video, click the green “Convert” button, and set your desired output directory on the called out panel. Click convert icon under to start converting. Unlike one-stop solution of Leawo Blu-ray to MKV Converter, Solution 2 is a little bit complicated; it takes the combined effort of WinX Blu-Ray Decrypter and HandBrake to rip Blu-ray movie with subtitle. 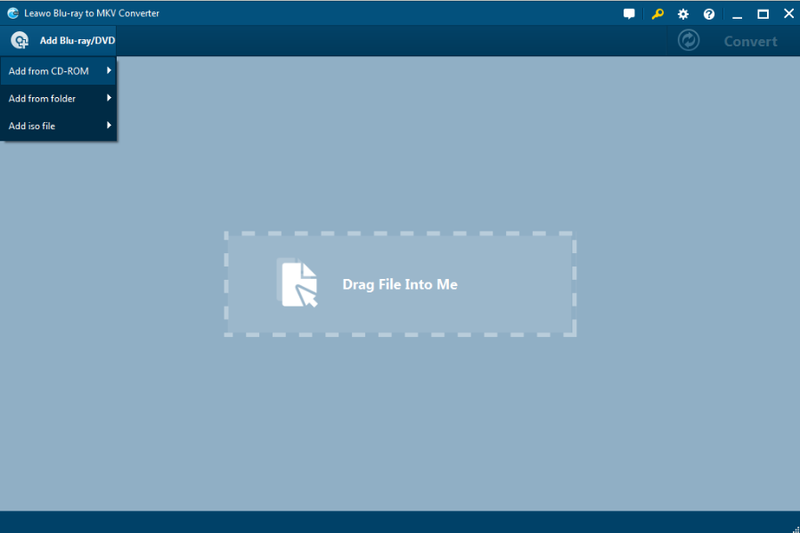 Before you start to convert Blu-ray movies to MKV with subtitle, you should download and install WinX Blu-Ray Decrypter and HandBrake. After the installation process is completed, you can follow the step-by-step guide on how to convert Blu-ray movies to MKV with subtitle. Launch WinX Blu-ray Decrypter to enter the main interface of the program, where you should click “Load BD” button to import target Blu-ray movie. Once Blu-ray movie is loaded, you can select Target Mode from “Full Disc Mode” and “Title Mode”. Finally, click “Run” on the bottom-right of the main interface to remove Blu-ray protections. Through the process, WinX Blu-ray Decrypter will turn input Blu-ray movie into BDAV format with an extension name of .m2ts. Lauch HandBrake, add M2TS file onto the program, and select title and chapter as per your requirement. 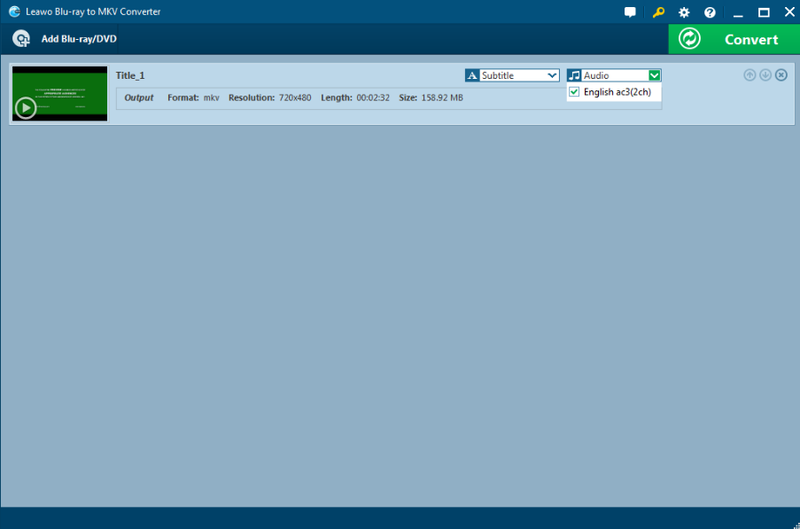 Click “Browse” to set output directory, and set output format as MKV in Container drop-down box. Choose desired subtitle or retain all original subtitles under “Subtitles” tab. After all settings is finished, click “Start” on the bottom-left sub-menu to rip Blu-ray to MKV with subtitle. To rip Blu-ray to MKV with subtitle, actually you can try another solution – Brorsoft Blu-ray Ripper. Now check out the full guide on how to convert Blu-ray movies to MKV with subtitle. 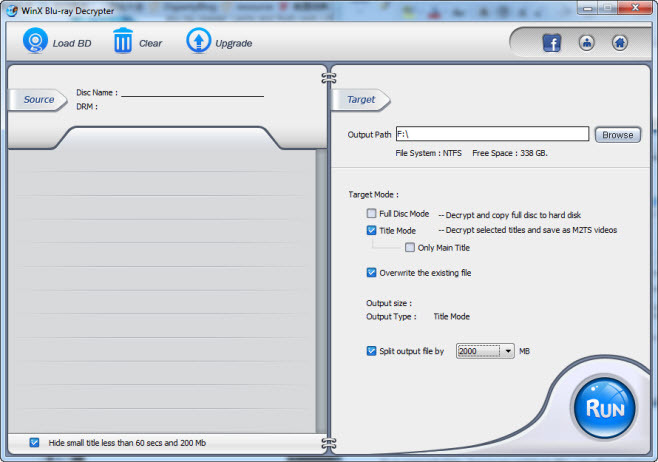 Download, install and launch Brorsoft Blu-ray Ripper to enter the main interface. Click “Load BD” button on program toolbar to load Blu-ray movies from disc or computer. Click “Subtitles” and select the one you prefer. And then select “MKV(Matroska) Video (*.mkv)” as output format from “Common Video” category under the drop-down list of “Format”. Click bottom-right button “Convert” to rip Blu-ray subtitle. Among the three solutions above, Leawo Blu-ray to MKV Converter and Brorsoft Blu-ray Ripper provide the one-stop solution to rip Blu-ray to MKV with subtitle. But Leawo Blu-ray to MKV Converter is much more effective as it doesn’t require MKV output format setting, saving users precious time. More importantly, users who have a tight budget are highly recommended to use Leawo Blu-ray to MKV Converter priced at $34.95 while Brorsoft Blu-ray Ripper charges $49.